How About RV Camping Historic Route 66? “Now you go thru St. Looey…Joplin, Missouri! You’ll see Amarillo…Gallup, New Mexico. US Route 66 is a former semi-trans continental highway. Established on November 11, 1926 as one of the original U.S. highways, it’s route spanned 2,448 miles miles from Chicago, Illinois, to Los Angeles California passing through Missouri, Kansas, Oklahoma, Texas, New Mexico, and Arizona along the way. Route 66 has also been known as known as the “Main Street of America” or the “Mother Road“. Over its history, starting in earnest in 1956 with the signing of the Interstate Highway Act, Route 66 was slowly replaced with more direct routes. The last section of Route 66 was decommissioned in Arizona with the completion of Interstate 40. US 66 was officially removed from the U.S. Highway System on June 27, 1985. Portions of the old US Route 66 in many states are now designated as “Historic Route 66” and other portions have been designated a National Scenic Byway. In Southern California, portions of the road have been designated as State Route 66. In 2008, The World Monuments Fund added US Route 66 to its World Monuments Watch list of 100 Most Endangered Sites. The National Historic Route 66 Federation characterizes traveling Route 66 as taking “the offramp into a bygone era.” As Route 66 was decommissioned, entire communities declined or perished. What has been left behind is a microcosm of roadside America stuck in time. Traveling the route (and 85% of it is can still be traveled) is like driving into a time machine to see the U.S. as it was. Tourists from around the world come to the United States to travel Route 66. Why not travel Route 66 in you own accommodations. An RV is a great way to see the attractions of Route 66. There are many RV campgrounds along the entire distance of Route 66. The Campgrounds page at Route 66 News site lists 10 Illinois RV campgrounds, 22 Missouri RV campgrounds, 1 Kansas RV campground, 13 Oklahoma RV campgrounds, 12 Texas RV campgrounds, 33 New Mexico RV campgrounds, 24 Arizona RV campgrounds, and 9 California RV campgrounds. The resource does not claim to be a complete list but it does appear to be up-to-date. 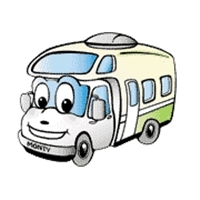 How About a One-Way RV Rental to Travel the Distance? Travel my way, the highway that’s the best. This entry was posted in RV Vacation Ideas. Bookmark the permalink. 2 Responses to How About RV Camping Historic Route 66?